While fans occupy themselves waiting for the release of Star Wars: The Old Republic and the third Mass Effect game, BioWare is busy working on something new — something that looks like this. That's right, BioWare is working on Rage. No wait, that can't be right, but a little over a month since id Software's post-apocalyptic shooter with Road Warrior tendencies hit it's the first thing that comes to mind when I see a vehicle of some sort colliding with another vehicle in a shower of shredded metal and dust clouds. What do we know so far? Not too much. Formerly referred to as simply 'New Project', Game Informer's Jim Reilly refers to it as a new franchise, meaning it's not tied to BioWare's former properties. Dammit, and here I was hoping for Jade Empire Combat Racing. 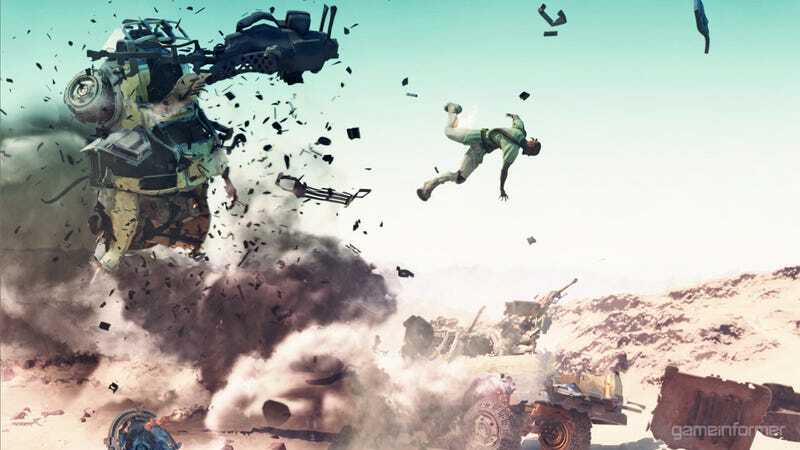 We'll find out more next month, with this new franchise making its debut at the Spike Video Game Awards on Saturday, December 10 on Spike TV, MTV2 And Spike.com at 8:00 p.m. Eastern. That leaves us only a month and change to speculate. We'd better get busy.